Remember the Weird Sandwich Metaphor I used to describe how all these different points of information (unconscious design vs. conscious personality, planets, and lines of the hexagram) all come together to flavor how we understand and experience each gate and channel? Today we're going to finish unpacking another one of those layers in the Weird Sandwich: the planets. To review: In Human Design, each one of our gates chills out with a specific planet or celestial body. 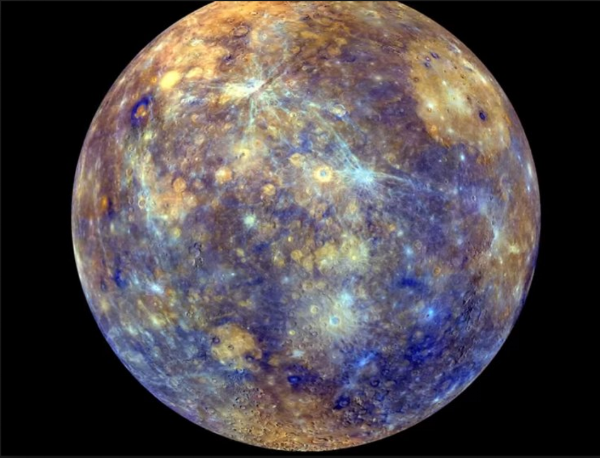 That planet's astrological symbolism and mythology provide CRUCIAL CONTEXT into how we experience the gift or lesson of that gate. Anywhere Saturn appears in our charts is an indication that through this gate or channel, we're going to be held accountable for the consequences of our actions. 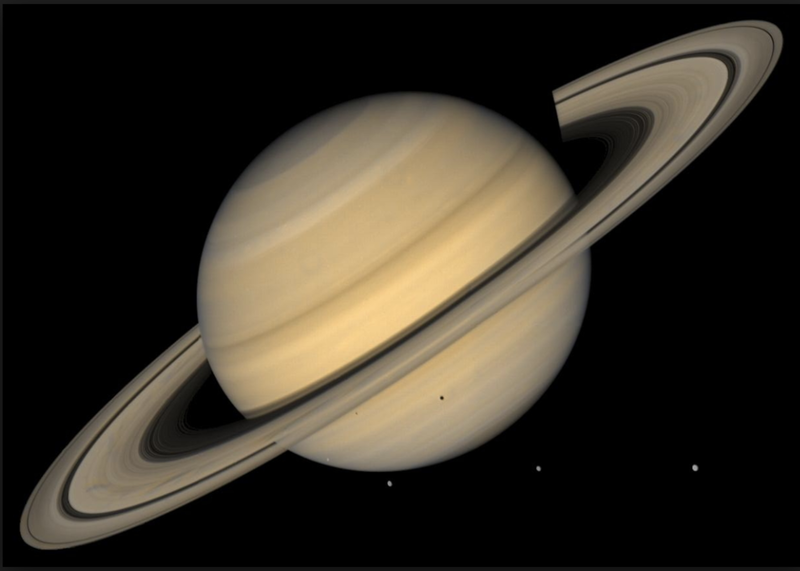 Saturn brings an energy of discipline and discernment and begs us to live up to our own values and morals. Just like a judge delivering a sentence, consequences follow when we act outside of our integrity, violating our own moral compass or personal laws. Real talk: Uranus is my favorite planet in our solar system because it is via Uranus that we let our freak flag fly and give expression to what makes us individual, unique and unusual. Uranus is known as the earthquake planet, and its influence shakes us out of our complacency and makes room for the new, the chaotic, the strange and the fantastic. The gates and channels that chill with Uranus push is to live our life as the bravest, most honest, unique version of ourselves. Neptune is all about surrender. It's one of the trickiest energies to pinpoint in terms of how it expresses itself in our lives. We can get clues from looking at where Neptune lives in our charts and recognizing when Not-Self behaviors (Frustration, Anger, Bitterness, and Disappointment) occur with respect to the gifts and lessons of those gates. Because Neptune is associated with spirituality, the gates and channels this planet touches can be a profoundly important teacher. Even though Pluto has been downgraded from formal planet status, it still brings strong energy to our design. Think rebirth, metamorphosis, transformation. Pluto is all about truth as it's by looking the truth square in the eye that change is fueled. Pluto touches the truest parts of us and teaches us to find light in the darkness, hope in the shadows. What gates in your chart are impacted by Pluto? Which are chilling with Saturn? What questions do you have about the gates and channels associated with Uranus in your chart? Let me know in the comments! Remember the Weird Sandwich Metaphor I used to describe how all these different points of information (unconscious design vs. conscious personality, planets, and lines of the hexagram) all come together to flavor how we understand and experience each gate and channel? 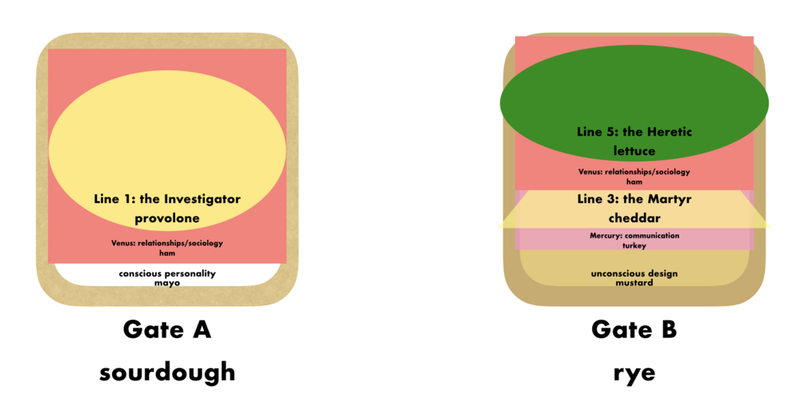 Today we're going to begin to unpack another one of those layers in the Weird Sandwich: the planets. In Human Design, each one of our gates chills out with a specific planet or celestial body. That planet's astrological symbolism and mythology provide CRUCIAL CONTEXT into how we experience the gift or lesson of that gate. The Sun represents vital life force energy, which makes total sense. Life as we know it on this planet would not exist without the life-giving light we get from the sun. Which gates the Sun touches in our charts lets us know how, when we're living our authentic design, we're meant to shine our light in the world. In practical terms, the energy of the Sun is embodied by what we do; it's the active yang to the Earth's receptive yin. If you pay attention to no other planetary influence in your chart, at least pay attention to the elements touched by the Sun. According to Ra Uru Hu, 70% of the neutrinos that condition our design/personality come from the Sun. This is why our profile is determined by which gates chill out with our conscious and unconscious sun, and why our incarnation cross is determined by which gate our conscious Sun lives in. It's through our gates that work with the energy of the Earth that we bring to form the gifts and lessons we learn through the Sun. Earth energy is all about grounding and balance. The energies we get from the Sun and the Earth are always operating together, and they are opposite each other on the mandala (the super complex version of the body graph. See Beyonce's below for reference). 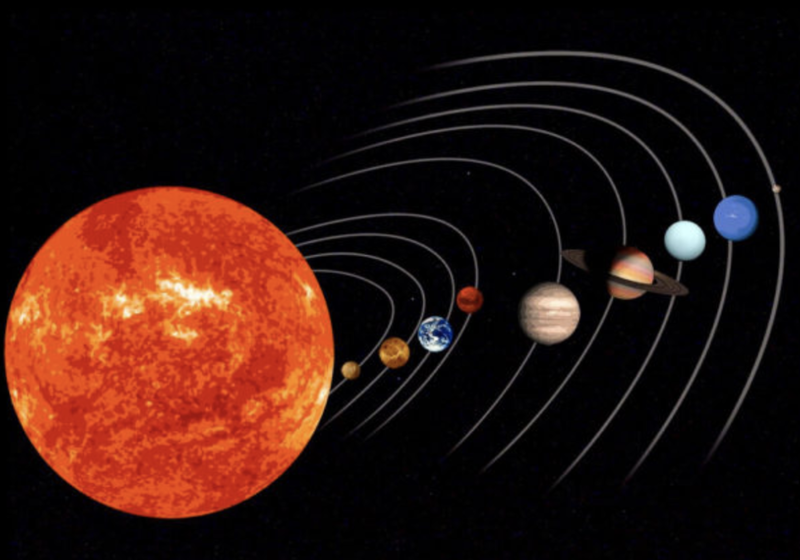 Just as the Sun is the Father archetype, the Earth is the Mother, the yin to the Sun's yang, and really helps to form the backbone and stabilizing force in our charts. the gates that are in your conscious (black) North Node are NOT who you are, but instead how your conscious personality views itself and the world around you. 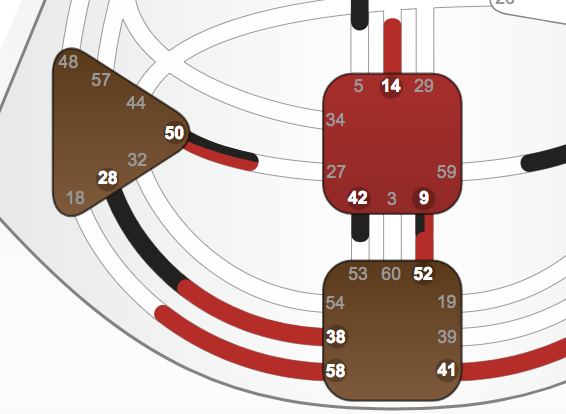 the gates that are in your unconscious (red) North Node act as a frame with which to understand your relationship to the people around you and to your environment. The energy from the North Node is all about maturing and growing with age, releasing what no longer serves us and holding onto what does. These gifts and lessons might really rise to the surface during each Full Moon, which is also all about releasing what no longer serves us. Just as the energy of the North Node is all about growing into our future, the South Node is all about our development and experiences that brought us to who we are at present. These gates are all about youth and immaturity and during the middle of our lives, we switch from the influence of the South Nodes to that of the North Nodes. Again, the gates in our South Nodes are all about those crucial moment in our childhood, adolescence and young adulthood that shape how we view the world around us and how we view ourselves as we work toward living our design. The Moon's energy moves us forward, and is the driving force in our design. Just as the Moon reflects the light of the Sun in our solar system, the Moon reflects the messages from where the Sun lands in our charts. And just as the Moon's pull impacts the tides, the Moon's pulls us away from or pushes us toward the lessons and gifts carried by the gates occupied by the Sun. In Astrology, the Moon represents our unconscious, innate characteristics, as does the Moon in Human Design. It's the way our inner nature is reflected out for others to see. The Moon also carries a feminine, elder daughter energy which works in concert with the Mother Earth energy to help us live out the gifts and lessons from the Sun's gates/channels. Which gates do you have in your Sun? In your Earth? How are they expressed in your daily life? How have the gates and lessons of your South Node shaped you into the person you are today? Let me know in the comments! Let me talk you through your gates and channels! Book a reading! Welcome to our fourth #AMAFRIDAY!!! It's the FREE PREVIEW WEEKEND for YOU by design. Check it out and let me know what you think!! I'll be posting a cheat sheet to our fear gates in YOU by design in the next couple weeks. If you submitted the first question, let me know so I can send you your code!! One of the more layered aspects of the Human Design chart are CHANNELS and GATES. Most people just research the quick description for the gate or channel and stop there, but THEY ARE MISSING SO MUCH GOOD INFO! I'm all about empowering you to get the deepest, truest info from your chart as possible, so to do so may I humbly present: The Weird Sandwich Metaphor. All of the different influences and energies that impact your channels and gates are kind of like making a super-complicated, kind-of-weird, multi-ingredient sandwich. Each ingredient of the Weird Sandwich™ represents a part of the channel/gate we have to take into account when unpacking it. If you are unpacking the meaning of a channel, you need to take the meanings of BOTH gates the channel contains into account. Each gate lives in a different center and carries a different gift or lesson, so it's like making a sandwich using two different types of bread. Unconventional, but think about what that would feel like in your mouth: in this example, you'd be getting both the flavor of the sourdough and the rye, as in a channel you get the energies and influences of both gates. Next, we need to take into account where each gate lives: on the body graph, is it listed in the black column or in the red column, or in both? Gates in our black conscious personality are probably really easy to identify with. Gates in our red unconscious design might take a bit more reflection and introspection to really pinpoint how they play out in our lives. Often times, these influences are so innate to who we are that other people might see how they impact us more than we can! One or more planets live in each gate. Here's where astrology and Human Design intertwine: the gift or lesson of the gate usually plays out in the part of our lives governed by that planet...and we're either super consciously aware of it (if it's in the black conscious personality column of our body graph) or totally unaware until it's pointed out to us (if it lives in the red unconscious design column of our body graph). Finally, each gate and its corresponding planet both chill out on one of the 6 lines of the hexagram, which brings a certain energy to how that gift or lesson plays out in that particular (planetarily influenced) part of our lives. Now, put both halves of the sandwich together and take a bite. Voilà! All of those different aspects give us clues as to how that particular lesson or gift from the channel will play out in our lives. The process also works for hanging gates...just make half of the metaphorical sandwich. Same stacking process, but less ingredients. Let's put the Weird Sandwich Metaphor into practice, and we can use a channel I see frequently in my readings (which is also in my chart): 28-38 The Channel of Struggle. In Ra Uru Hu & Lynda Bunnell's book The Definitive Book of Human Design, a (dense) explanation of each and every channel is given. As a brief summary, these gates together form a channel that connects the Sacral Center to the Spleen and provides me with the energy I need to fight for my life to have meaning and purpose. I'm designed to have an impact and for my life to have meaning, and this channel fuels my search for purpose and service. Gate 28: The Gate of the Game Player (Fear of Death/Purpose): Lives in the Spleen Center and fuels our awareness of whether or not to struggle for purpose/meaning. Gate 28 is also a fear gate, and fear gates teach us recurring lessons over the course of our lives. The fear here is around taking risks and can surface as either a fear of taking risks OR a fear that life has no purpose unless you take risks. Gate 38: The Gate of the Fighter: Lives in the Sacral Center and puts a pressure on us to find the meaning in and our purpose in life. 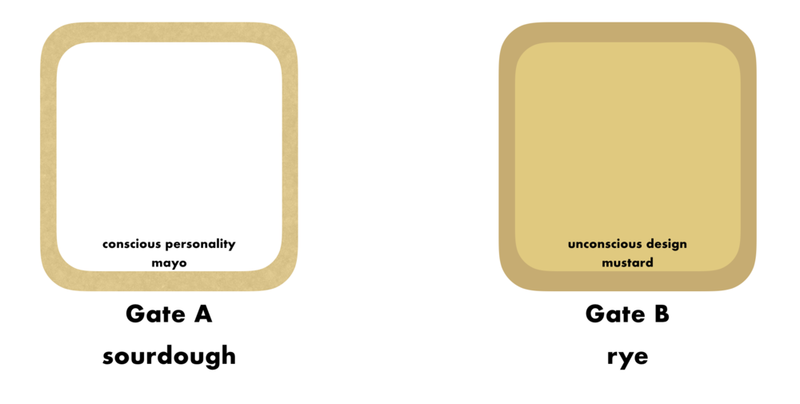 One gate lives in my conscious personality, and one gate lives in my unconscious design, so I'd have two different condiments, one on each slide of bread. My Gate 28 lives in my conscious personality, which means I'm probably super aware of how this fear energy plays itself out in my day to day life. And I am! For me, quitting my corporate job to start this blog and take on clients was a HUGE risk. As I've shared, I had zero idea when I turned in my resignation what interior creature would turn into. What I did know, however, was that I had lost my sense of purpose and I needed to take steps pretty drastic steps to find it again. My Gate 38 lives in my unconscious design, which means it's such an innate, unconscious part of who I am that I a) might not have realized that it was integral to who I was until it was pointed out to me or b) just assumed everyone felt that way. The latter is true for me. I just assumed (wrongly) that everyone was fueled by this inner push to find meaning in the madness of life...and the more I seek with this awareness now on my radar, the more I realize how incredibly different and unique each person's individual driving force is. I have three planets in this channel, so three different slices of meat, two on one slice of bread and one on another. My Gate 28 lives in my conscious Saturn. We're going to go deeper into each planet soon, but Saturn is all about discipline, judgment, and restraint. The lesson I'm learning about taking risks in an effort to find my purpose is all about relying on my strategy & authority to help me discern which risks are the *right* risks for me to take, being disciplined and not trying to live out anyone else's purpose but my own. I have three different lines impacting each gate and its corresponding planet, so each piece of meat gets paired with a different type of topping. My Gate 28 and my conscious Saturn live on line 2 of the hexagram, the Hermit. As I'm trying to determine my purpose, I'm going to feel this push and pull between wanting to be alone in my Hermit cave, nerding out about all the things I'm passionate about and give my life meaning. BUT Hermits can't stay in their caves forever, and actually need to come out and interact with others so that they can determine what their talents and gifts are, and how to use them to benefit the Tribe. How this played out for me: when I first started reading charts, it took a former colleague/close friend to tell me that I had a real talent for it and needed to share it with other people for me to take my practice public. Without her calling it out as a gift, I don't know if I would have had the courage to take the risk that lead me to where I am today. My Gate 38 and my unconscious Moon live on line 5 of the hexagram, the Hereitc. The Heretic is the "stranger of consequence" and is often looked to to solve the problems of others. Sometimes, this is absolutely what the Heretic is here to do, and other times...not so much. My search for purpose involves being of service to others, and my lesson through this channel is to make sure I'm using my strategy and authority before jumping in to solve each and every problem...as not all problems are mine to solve. This comes up in my readings ALL THE TIME. Many times, people come to me on the precipice of making a big change, and want my take. I have to be very clear that I can only tell them what their chart says, and that our charts aren't psychic blueprints, and whereas I can weigh in with my opinion or what my intuition says about the guidance their chart provides, I can't make that call for them. Let me make you a weird sandwich ™ via a 1:1 Human Design reading! Have you started to unpack the gates and channels in your chart? Is the Weird Sandwich Metaphor™ helpful? Let me know in the comments!